No garden? No problem. This compact low-level bistro set was made with urban living in mind. It’s the ideal size for a balcony or smaller patio. Use it to make the most of your outdoor space, whatever the size. Tice was made to turn heads. It’s got a soft-looking shape and choice of colour options. Go for grey to keep in tone, or on-trend chartreuse for a striking look. 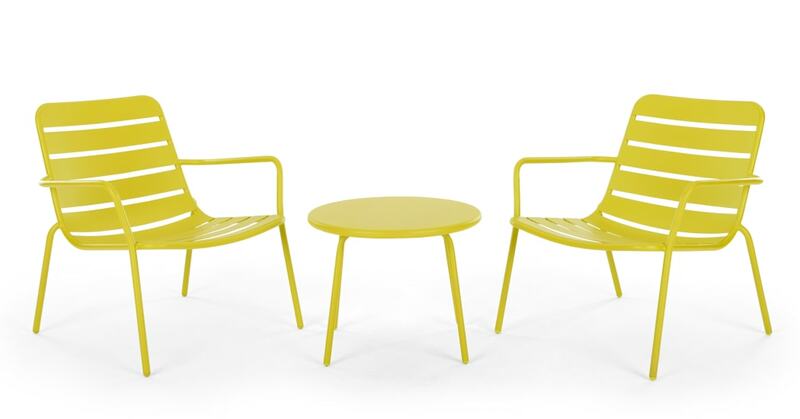 Both in powder coated steel and robust enough to leave outside all year round. We’re taking our MADE Essentials range outdoors. Find simple, well-designed and wallet-friendly furniture and accessories. Perfect for smaller gardens and sunseeking city-dwellers.